I underestimated the amount of time it would take me to complete all of the hanging ornaments I’d planned for my family this year, and so ran out of time to finish that one little project that I had planned for myself prior to Christmas! 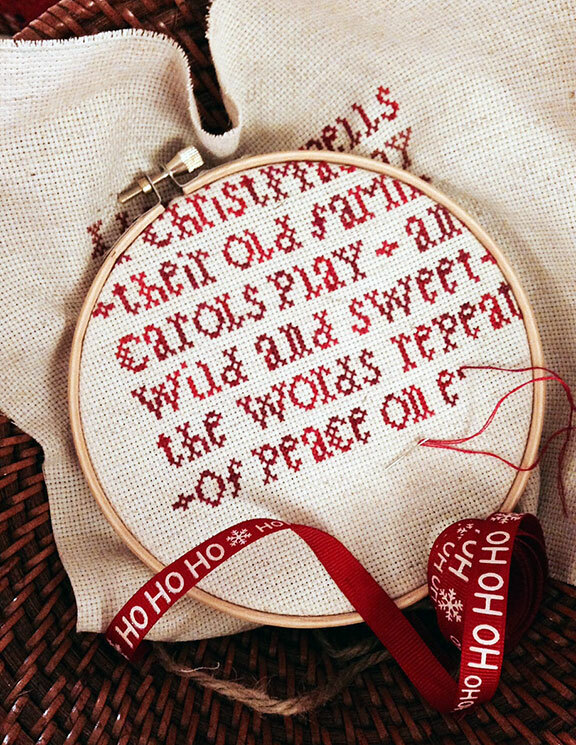 Thus I find myself still working on the “Christmas Bells” chart from The Sampler Girl. I decided to use up an 18-count Aida scrap and some variegated DMC floss instead of what was called for in the chart, and intend to make this up into a decorative mini-pillow, with the exact finishing to be decided later. I have an idea to add some red buttons as accents to the corners, and maybe even use this piece to experiment on with aging the fabric, but we’ll see. This is one of the few pieces I’ve ever worked where each individual stitch must be fully completed before moving on to the next, which makes it a little more challenging than some of my past projects, but I do love how the color subtly changes as the words progress across the fabric. What can I say but that I love your site? Today, I went back and read all of your older blogs, remembering fondly many of the projects you have stitched over the years. I am proud to be the sister of such a talented person. It is so true that we are connected to others by the fibers of our lives. Our love for our friends and family is captured in the threads we sew into our projects and into the patterns those fingers make. Aren’t we lucky to keep making connections? To be able to share our love for those we hold dear?